Wall Street is all strapped in and ready to buy or sell Apple's shares in bunches. Tomorrow, after the market closes, the company will report its fiscal third quarter earnings. Traditionally, this is the weakest period of the year for sales of Apple's smartphone since most consumers are awaiting the new models to be unveiled in September. As we noted the other day, the consensus of 17 Wall Street and independent analysts is that Apple will report sales of 42.05 million units during the period from April through June. That would represent a small 2.4% year-over-year gain. But Swiss banking house UBS says that traders, investors and the general public are too focused on the number of iPhones that Apple rings up each quarter. More important, says the firm, is the Average Selling Price (ASP). 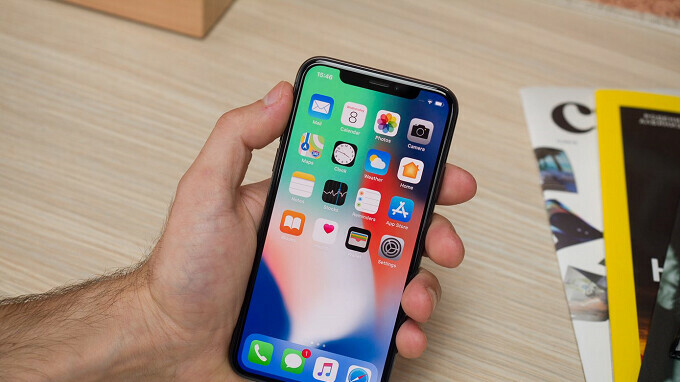 UBS analysts say that any decline in the number of iPhone handsets sold by Apple last quarter, will be more than made up by sales of its highest price phone, the iPhone X. A recent study done by CIRP found that 26% of Apple consumers paid more than $900 for their phones in March. That was sharply higher than the 5% that paid $900 and up for their phones during the previous year. That an increasing number of consumers are willing to pay $900 or more for their smartphones should show up in the Average Selling Price figure that Apple will report tomorrow. During its fiscal second quarter, Apple reported an ASP of $728, an 11% year-over-year increase from the $658 Apple reported in 2017's fiscal Q2. The number of iPhone units sold by Apple last quarter will still be the headline figure tomorrow afternoon, and will still drive the stock up or down after hours Tuesday. But if Apple disappoints and reports fewer iPhone units were sold than expected during the quarter, you might want to check to see if the Average Selling Price rose before you dump your Apple shares. How can be the ASP just $728 when iphones cost much more than $1600 out of USA/WESTERN EUROPE? It is averaged out over all their sales. The older iPhone models sell for less but cost the same as the new models. The iPhone 8 basically costs the same as the iPhone 7 to make, but one sells for $100-200 less. Apple sells more older models than new models most of the time so that is why the ASP is lower than the margin on the newer models. "Apple sells more older models than new models most of the time so that is why the ASP is lower than the margin on the newer models." No they don't :D Apple best selling models are always the newest ones, thats why their ASP is that high. "Apple best selling models are always the newest ones, that's why their ASP is that high." That's been proven to not be true many times. They have a high ASP, because all the models sell at a significant higher price, than what it cost them to make. Apple doesn't have to have a lot of high sales of the iPhone X. In fact the 7 and 8 both are still outselling the X. But because the X's cost is so high above their manufacturing cost, they get a high ASP because Apple gets 100% of all sales. As long as Apple sells a certain amount of devices, at a minimum cost of $700, they will have a fairly high ASP that is above the lowest costing devices they make which cost $699 on retail. They still sell iPhone6s, and iPhone SE. So numbers of sold units aren't important now? Just the profits right, greed before all else as per normal business. We've all witnessed this for a decade. Wittle suppliers costs, corner technology with legal barriers to others, pay workers lowest possible dollar, keep money off shore, throw a fit when they have to pay royalties to others and litigate to default payments, and charge based upon social status aquired from someone who was a egotistical snob above all else. Oh, and no app drawer still right. I'm surprised Apple can copy and paste, err wait they actually do that pretty good in hindsight. Sorry, had to vent. Why are you so mad about this? I guess PA skewing Samsung for not breaking new sales records yet still doing ok is a bleak sign of things to come. But this OEM can rest easy because profits are through the roof and that is only sign worth anything. I don't even really care for either camp, just the aire of superiority over previously today suggested inferiority is frustrating to consume.